Expert Views :: Are We Still Forgetting the Other 95 Percent? First, and for the ecological reasons described above, one would hope that any comprehensive program that seeks to protect our environment from the potential harmful effects of endocrine disruptors includes the invertebrates. Secondly, hormonal regulation is a characteristic common to all animals. Invertebrates generally use their endocrine systems to regulate processes similar to those found in the vertebrates, processes such as growth, development, and reproduction. Thirdly, a growing (though still very limited) number of field examples of endocrine disruption affecting invertebrate populations have been published, and it is suspected that many more cases are still undetected. Finally, invertebrates have been used for decades as important models for research, and they are crucial components of chemical regulatory screening and testing programs all over the world. 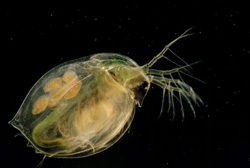 Daphnia are commonly used in endocrine disruption research. So, what is the present and potential future role of invertebrates in endocrine disrupter research and in testing and screening programs? Current regulatory efforts to screen and test chemicals for endocrine toxicity largely focus on effects on humans. In the US, the Environmental Protection Agency (EPA) identified endocrine disruptors as one of its top six research priorities in 1996. The EPA was mandated to develop a screening program, using appropriate validated test systems and other scientifically relevant information, to determine whether certain substances may have an effect in humans similar to the effect produced by naturally occurring estrogen. Since then, EPA's focus has been extended to include effects on vertebrate androgen and thyroid systems and on non-vertebrate animals. Specifically, one arthropoda assay is being proposed for in vivo testing, a mysid assay (Mysids are small crustaceans.). 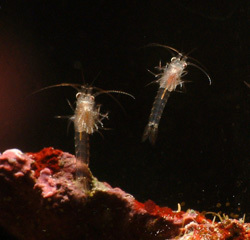 These tiny mysid shrimp may be used in future testing programs to screen chemicals for endocrine disrupting actions. On an international level, a task force on endocrine disrupter testing and assessment was established at the request of the Organization for Economic Cooperation and Development (OECDb) in 1998. OECD recently published a draft detailed review paper on the use of aquatic arthropods for endocrine disruptor studies, which includes specifics on life cycle and multi-generation testing with mysids, daphnids, copepods, and chironomids. A number of other countries (notably Japan) and non-governmental organizations have set up programs addressing policy, regulation, and scientific research that include one or more arthropod modelsc. Unfortunately, the focus of current testing programs on three vertebrate signaling pathways (estrogen, androgen, and thyroid) poses the risk of seriously underestimating the ecological effects of endocrine disrupters. None of these three pathways, nor their respective receptors, have been identified in the invertebrate species that are presently being considered for in vivo testing. Most likely, estrogens, androgens, and thyroid hormones play a less important, if not trivial, role in most invertebrates. As such, a 'quick' in vivo chemical triage based on estrogen/androgen/thyroid receptor interaction (e.g., binding), as is presently being proposed by regulatory agencies, seems scientifically unsupported. Fortunately, we do have a fairly good understanding of arthropod endocrinology, and we have full genome sequences for an ever-increasing number of arthropod species (honeybee, fruit fly, mosquito). The Daphnia genome is being sequenced, and hopefully other invertebrates commonly used in toxicity testing will follow. What's more, the molecular targets of many insecticides have been studied in great detail for the purpose of developing specific pesticides. These studies provide those of us in the invertebrate endocrine disruption business, with a wealth of data on how chemicals disrupt specific hormone pathways in certain animal pests. We know, to some extent, which hormone receptors are being targeted by these chemicals and how they affect physiological processes such as molting, embryonic development, growth, and reproduction. We have a unique opportunity to exploit this knowledge in the study of chemical effects on hormone regulation in other (non-target) arthropods, such as the model organisms presently being considered in screening and testing programs. This should allow us to study hormone regulation and its chemical disruption in mysids, daphnids, copepods, and other animals, in ways previously not possible. Copepods and other invertebrates are good models for studying hormone disruption. A number of significant advances I see, or hope to see, are (1) the identification of the molecular targets (e.g. receptors) of endocrine toxicants in the species presently proposed in screening programs; (2) a mechanistic understanding of hormone regulation and signal disruption by chemicals in these animals; (3) better predictive and modeling power within a species (across levels of biological organization, i.e., from receptor to population), and across species; and (4) assays that look at chemical effects on hormone systems that are specifically relevant to invertebrates (such as effects on molting, metamorphosis, etc.). I am hopeful that the initial inclusion of invertebrates in regulatory screening programs worldwide wasn't just an easy-way-out approach to covering the ecological bases. In vitro assays that are relevant for non-vertebrate species need to be included in the initial rapid screening phase of chemicals. The proposed invertebrate in vivo assays will need to be optimized using information that will be made available over the next few years by studies using new genomic approaches. It makes sense to start with animals that are already incorporated or proposed in existing testing and screening programs, such as mysids, daphnids, and copepods. There are many reasons why these animals would make a good first start, many of these are the reasons that make them great toxicity testing models. However, the use of a limited number of species as representatives of the enormous invertebrate diversity is a naive approach destined to failure in the absence of suitable safeguards. As more information becomes available, other invertebrate models will need to be included. This inclusion could be based on evolutionary considerations (i.e., pick animals from important time points in evolution). Prime candidates would be invertebrate deuterostomes such as sea stars and urchins (genome projects are underway for these animals) and members of the Lophotrochozoa, the other big protostome clade (next to the Ecdysozoa or molting animals) that includes annelids and mollusks. Ideally, greater integration of toxicology and molecular biology should lead to greater incorporation of established toxicity testing models in future genome sequencing plans. This would allow us to expand our battery of invertebrate endocrine disruption assays with well-established toxicity testing models. A number of good things have happened since that 1998 meeting in The Netherlands. Most importantly, the invertebrate community has taken a step back from trying to sell their invertebrates as a quick and easy way to do vertebrate risk assessment. This doesn't mean that invertebrates cannot enhance our understanding of hormone regulation and its chemical disruption in ways relevant to vertebrates. It generally was, and unfortunately still is, a necessary evil for us to 'sell our science.' However, it is an oversimplification that has not done us much good. We will never come to a thorough understanding of invertebrate endocrine disruption if we do not incorporate all the diversity, difficulties, and uncertainties that come with it. We need to sell our invertebrates for what they are. And let's face it, it shouldn't be a hard sell. We just need to train our 'buyers,' whether they are our fellow scientists, the public, or regulatory and funding agencies. Dr. Jesse Meiller (US Environmental Protection Agency's Office of Science Coordination and Policy) and myself are organizing a special session on endocrine disruption in invertebrates with a focus on history, regulation, and current and future research at the Society of Environmental Toxicology and Chemistry (SETAC) North America's 26th Annual Meeting to be held 13-17 November 2005 at the Baltimore Convention Center in Baltimore, Md. I hope to see you all there for a more extended discussion on this topic. a Arthropods: Arthropods are the most successful animals on this planet by nearly any measure. 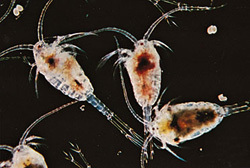 They contain the crustaceans (copepods, mysids, shrimp, lobsters, crab, etc. ), the insects, spiders, scorpions, mites, ticks, horseshoe crabs, and millions of other undiscovered species. b OECD: The Organization for Economic Cooperation and Development is an intergovernmental organization in which representatives of 30 industrialized countries in North America, Europe, and the Asia and Pacific region, as well as the European Commission, meet to coordinate and harmonize policy. c For a detailed review on international efforts on endocrine disruption, I encourage you to read a very informative report by the Institute for Environment and Health for the European Commission, referenced below. DeFur PL, Crane M, Ingershold C, and Tattersfield L. 1999. Endocrine Disruption in Invertebrates: Endocrinology, Testing, and Assessment. Pensacola, Fla.:Society of Environmental Toxicology and Chemistry. DeFur PL. 2004. Use and role of invertebrate models in endocrine disruptor research and testing. ILAR Journal 45(4):484-493. Depledge MH and Billinghurst Z. 1999. Ecological relevance of endocrine disruption in marine invertebrates. Marine Pollution Bulletin 39:32-38. LeBlanc GA. 1999. Screening approaches for the evaluation of endocrine disruption in invertebrates. In Environmental Toxicology and Risk Assessment: Standardization of Biomarkers for Endocrine Disruption and Environmental Assessment, Vol. 8, ASTM STP 1364, ed. Henshel DS, Black MC, and Harrass MC, pp. 3-23. West Conshohocken, Pa.:American Society for Testing and Materials. McKenney CL Jr. 2005. The influence of insect juvenile hormone agonists on metamorphosis and reproduction in estuarine crustaceans. Integrative and Comparative Biology 45:97-105. OECD (Organization for Economic Cooperation and Development). 2005. Detailed review paper on aquatic arthropods in life cycle and two-generation toxicity tests. OECD Environment Health and Safety Publications, Series on Testing and Assessment No. 50. Paris, France. http://www.oecd.org/dataoecd/31/7/34241659.pdf. Oehlmann J and Schulte-Oehlmann U. 2003. Endocrine disruption in invertebrates. Pure and Applied Chemistry 75(11-12):2207-2218. IEH (Institute for Environment and Health). 2003. Information exchange and international co-ordination on endocrine disruptors. IEH Ref. No 3/9/7, European Commission. http://europa.eu.int/comm/research/endocrine/pdf/ieh_report_en.pdf. Thomas CD. 1990. Fewer species. Nature 347: 237. Thornton JW. 2003. Nonmammalian nuclear receptors: Evolution and endocrine disruption. Pure and Applied Chemistry 75(11-12):1827-1839. Tuberty S and McKenney CL Jr. 2005. Ecdysteroid responses of estuarine crustaceans exposed through complete larval development to juvenile hormone agonist insecticides. Integrative and Comparative Biology 45:106-117. Verslycke T, Fockedey N, McKenney CL Jr, Roast SD, Jones MB, Mees J, and Janssen CR. 2004. Mysids as potential test organisms for the evaluation of environmental endocrine disruption: A review. Environmental Toxicology and Chemistry 23(5):1219-1234.